“I have a feeling that you are a question person, and that is very, very good,” says Yoko Ono, responding to one of my questions, in her first email to me. The legendary artist has insisted upon web communication rather than phone these days, but in this – and our prior conversations – she has proven to be particularly adept at communicating her grand personality in text. Her responses are brief, yet revealing. She uses the kind of lines that appear frequently in her art: somehow mystic and straightforward at the same time. Our conversation is taking place in the time leading up to, and just after, the release of Warzone, Ono’s latest album. Released last month, the collection comprises stripped-down takes on some of Ono’s classic songs, with minimalist tracks framing her maximalist vocals. My questions spring from the album, though of course, any record focused on re-envisioning tracks recorded decades ago will result in concentric conversational circles. That seems to come as no surprise to Ono. While she responds to the majority of my questions with wise responses, her reading of me as a “question person” reveals a core of her philosophy. “Progress is made from such questions,” she adds. As someone who has spent a good deal of time asking questions – literal, spiritual, and metaphysical – Ono knows their importance, but also that, despite our best intentions, simple answers aren’t always available. “People of America / When will we learn? / It’s now or never / There’s no time to lose.” These lines come from Ono’s “Now or Never”, originally released on 1973’s Approximately Infinite Universe but still, sadly, relevant today. For Ono, though, these words act as a reminder that there is still so much we can do. As seen through Warzone, which updates “Now or Never”, the old adage that those who don’t remember history are doomed to repeat it isn’t necessarily a threat. The repetition can just as easily be an opportunity to grow, learn, and change. For decades, Ono has explored the outer edges and very essence of emotional expression, contorting her voice to places at once alien and intimately familiar. To that end, there’s undoubtedly a sense of sadness when she sings 1973’s “Woman Power” in 2018, a song that’s still sadly poignant today, but she does so without any loss of vigour. When Ono sings “Imagine”, it carries the hope she and John Lennon shared in the early 70s, as well as the tragic reverberations of her husband’s murder, and all the people still not living in peace. On Warzone, Ono offers some powerful answers, urging on the change we all need. But sometimes there isn’t a simple answer, and in those moments, Yoko Ono is a question person, urging us all to gain ground in her footsteps. A lot has changed since you initially published “The Feminisation of Society”, but there’s definitely still so much that needs to shift. How does it feel to share those words again in the liner notes for your new album? Yoko Ono: I think that many people have not read it, and it’s a writing that would maybe give them an uplifting power. I was particularly struck by how little synchronicities pop up in the lyrics on Warzone that could just as easily be direct references to modern day. Do you see those kinds of recurrences and cycles as fate? Yoko Ono: I think the more we think about it, and the more we talk talk about it, things will change quickly. A lot has been made of the politicisation of the world today, as we live in a time at which every moment is filled with the power of politics. Have you felt a change in the weight of politics? Yoko Ono: Very heavy, but that is not a bad thing. We will go on changing, making new roads. I’ve always been so entranced by your art for its ability to make a seemingly simple sequence of words into a maximalist statement with immense power. I’m thinking of the handwritten words on protest signs, specifically. Was that a conscious part of your art from the start – the ability of a title to overwhelm the brain? Using the word Warzone as the album title shows the constant state of war that we feel at today. How do you think that change from literal war to constant mental stress and anxiety will change the way we live? What about the way we rely upon art? Yoko Ono: I caught your seventh last question. I have a feeling that you are a question person, and that is very, very good. Progress is made from such questions. How important is reputation to you? Yoko Ono: Reputation can sink you or save you. I would think that I did very well considering that I’m still alive. How essential is the idea of community? Or rather, how important is it to be a part of an artistic community? 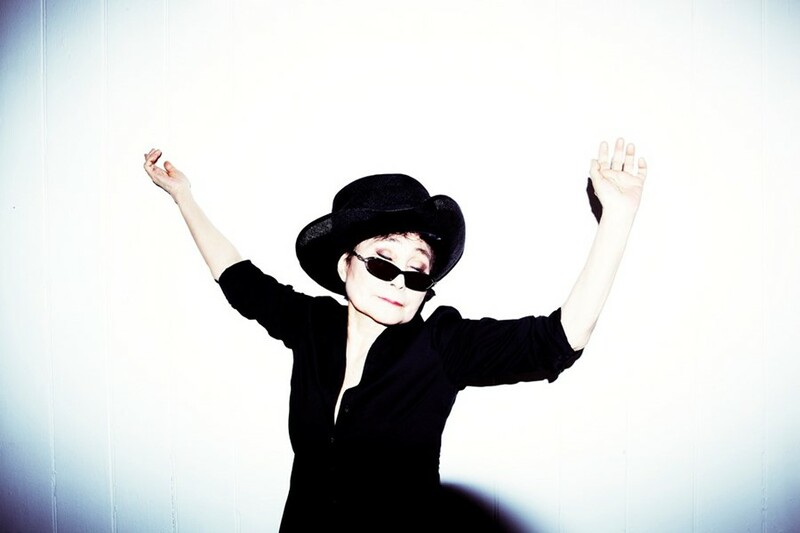 Yoko Ono: I was in the artistic community since I was three-and-a-half years old. I don’t know how important it is. You can make it without other artistic people, but that’s how it happened to me. How do you define success, and how do you define failure? Yoko Ono: I don’t remember unsuccessful ones. Instead of thinking about that all the time, I would chuck it and go on living. What’s one habit that you fight against, and how do you do it? Yoko Ono: I am very concerned about what damage it would do to me for keeping my habits, so I’d rather chuck my habits and keep on doing something much more interesting. Do you have any creative rituals around making music? Yoko Ono: In terms of music and art, they all just come to me as an inspiration. Many times I was saved by those inspirations. I wanted to talk about intention. Maybe the best advice for young songwriters and artists is to not worry so much about the kind of art you’re trying to make, but rather what your intention is. What do you want art to do? Yoko Ono: It gives me the courage to go to the next step. What’s something you wish someone would’ve told you when you began making art? Yoko Ono: Nobody told me anything, and I’m kind of glad about that.